‘Intimate’ gig promises a treat for all you pretty things . . . They arrive in the dark, carrying their instrument cases, and with no fuss plug in and tune up, perching on the furniture pushed to the walls to make room. Within minutes of the last man arriving, they are picking out chunks of well-known songs, from The Beatles to Thin Lizzy – and these guys know how to play. Called to order by no one in particular, they take David Bowie’s Oh You Pretty Things from the top and produce a version that’s far beyond an attempt to copy, bringing a great sound of their own. So how can this be; who and why are these people gathered in a house in Barnt Green (or Lickey, for those who like accuracy)? Well, six of them are some of Birmingham’s most successful musicians of the past few decades. 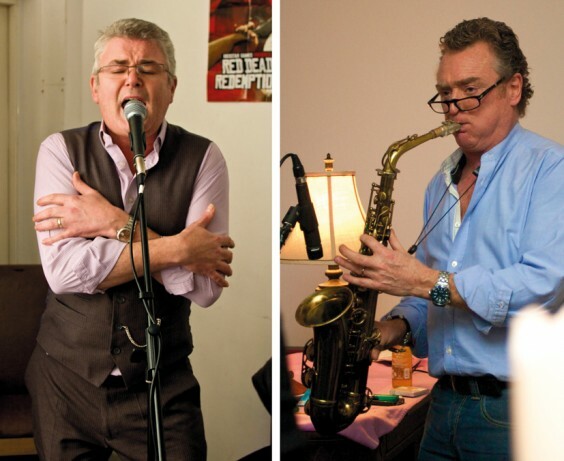 For a start, there’s Brian Travers, of UB40, on saxophone (pictured above right). Then, listing just a few of the bands they’ve played in, there’s Richard March (Pop Will Eat Itself) on bass; Tim Felton (Broadcast) on acoustic guitar; Keith York (The Lightening Seeds) on drums; Andy Pell (Brazziliant) on guitar; and Dave Roberton (Wild Clover) on keyboards. And who’s that singing lead vocals? It’s George Davis (above left), whose house they’re at and whom many Village readers will remember from his days running his eponymous hair salon in Alvechurch. He tells The Village the band got together when a group of musicians were chatting at the Hare and Hounds, in Kings Heath, a popular live music venue, about what had inspired them. They found a common thread in the music of David Bowie and Roxy Music and, lo, Hunky Dory was formed – named after Bowie’s 1971 album. George got in on the act because the regular singer, Owen Comaskey, is away in New York a lot fronting another band, so they auditioned for a fill-in lead vocalist. “I’ve known Brian for years, since he popped in for a haircut and I recognised him. He suggested I audition back in June – and I got it,” says George, who now has a salon in Bromsgrove. Since then, the band has gelled and before they “take it further in the UK” they are putting on what they describe as an “intimate” show in Alvechurch. December 10 promises to be a great night for anyone weaned on Bowie and Bryan Ferry, with a few favourites from other bands thrown in – and George promises Mott the Hoople’s All the Young Dudes (written by Bowie, of course) will be a highlight. It’s only £7 on the door at Alvechurch Sports & Social Club – there are no tickets, so get there early.